1 It has a long history. The roots of the sign go back to 1940, when the Cities Service Co. opened a divisional office at 660 Beacon St. and installed a huge neon sign on the roof of the building. The sign was round and featured the green-and-white Cities Service logo. The Globe reported that it was one of the largest neon signs in New England. That original sign was replaced in 1965 after the company created the Citgo brand and erected the square-shaped sign that we all know today. 2 It’s been loved . . . and hated. Globe architecture critic Robert Campbell called the Citgo sign “Boston’s Big Ben” and “the biggest, brightest, and best illuminated sign in Massachusetts.” One insightful observer said it was “Boston’s very own North Star.” But it had its share of critics, too. Some called it an eyesore, and a waste of electricity. At one point, it was going to be taken down. In 1982, The Globe reported that “the Citgo sign, like a movie queen with just a trace of the beauty that once electrified screens, is past its glory.” But residents rallied to save the sign, and ultimately the Boston Landmarks Commission issued a cease-and-desist order to stop the sign from being dismantled. Ay, tear her tattered neon down! That emblem in the sky. 3 The sign went dark for years. 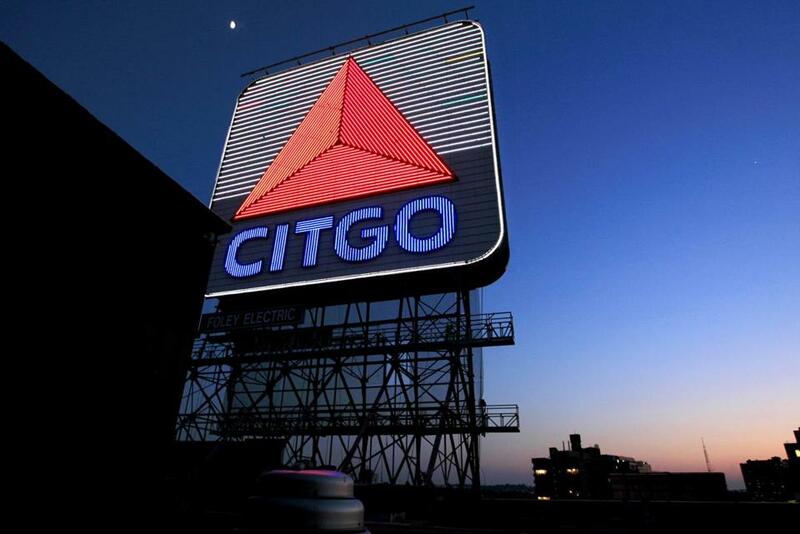 The Citgo sign is illuminated every night, from dusk to midnight. But that was not always the case. According to Citgo officials, the lights were turned off in 1979 at the request of Governor Edward J. King “as a symbol of energy conservation.” The sign remained dark until the night of Aug. 10, 1983.. The Globe reported that a large crowd gathered in Kenmore Square just before 9:30 p.m. to witness the sign light up once again. 4 It had a makeover. The Citgo sign is illuminated with approximately 218,000 LED lights that were installed in 2010. Citgo officials say this LED system is more energy-efficient than the original neon. It uses roughly half the electricity, which saves more than $18,000 annually. Federal Heath Sign Co. handles maintenance and makes repairs as needed. 5 It moves. The Citgo sign measures approximately 60 feet by 60 feet . . . and yes, it moves. Citgo officials say if the wind is powerful enough, the sign can sway as much as two feet. But they say not to worry: the LED lights are designed to withstand the worst weather, and its “sturdy positioning” keeps it in place.